The Chennai floods this season have broken all records. The city has not been hit with a rainstorm of this degree in about 100 years. The entire city is reeling under the effects of this flood, with many becoming victims of diseases and injuries as a result. Floods in your city can increase the spread of waterborne diseases such as cholera, typhoid, Hepatitis A etc. Not only that, the transmission of vector borne diseases such as dengue, malaria and Chikungunya increases as well. Severe flooding can even lead to accidents such as electric shocks. However, there are certain precautions you can take to avoid these potential health hazards. 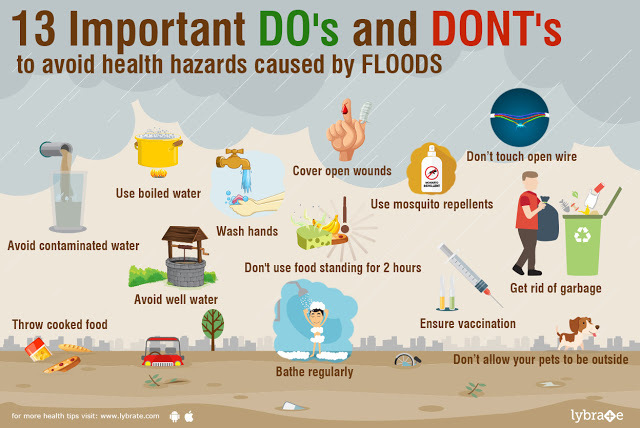 By adopting these simple measures, you can safely avoid the most common types of health hazards prevalent during floods.